Destination and beach weddings will always be popular, and if you're planning one, there's no better way to top off your reception than with a fun cake design. 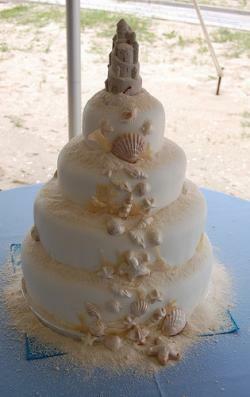 There are many variations on the tropical theme, including beach cakes, cakes with shells, and even island cakes, but perhaps the most unique is the sandcastle wedding cake. Get ideas for creative designs by flipping through any coffee-table book of tropical photographs or looking at pictures of sandcastle competitions, but you might also consider designing your own cake and carefully choosing flavors to go with the look. A cake that resembles an actual sandcastle, complete with turrets and starfish bride and groom toppers, makes a great statement. Fondant adds realistic touches to the turrets and "walls" (tiers) of the castle cake. Use a three-tier cake covered in a pale, sandy color of fondant and adorned with fondant starfish or fondant seashells, with only a couple of castle-like features. 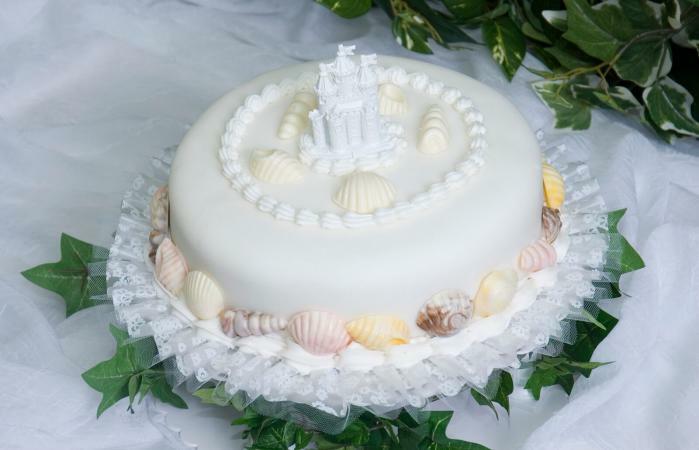 The seashells that lead to the castle topper make this cake simple yet perfect for a beachside event. The sand on each tier is the perfect finishing detail. A modern twist on the traditional design is to have a castle cake with a more contemporary architectural style. The building could be more angular and smaller, with multiple tiers and different features on each tier. Alternatively, you could purchase a castle-shaped cake pan and use brown sugar or crushed graham crackers to cover the cake with a light hand. This allows the details to stand out. A common design for a sandcastle cake looks a bit like a famous castle in Germany, Neuschwanstein. To resemble the castle, the cake would have turrets, towers, and a significant degree of detail, including features such as a drawbridge, a moat, or a large front door. However, you can save some cash if you design the cake yourself or bring a design for your decorator to use as a template. Even if you don't want to do the full design yourself, you can make up a rough sketch to deliver to the decorator, who will then be able to get an accurate idea of what you want with the dessert. In general, more basic cakes are going to cost less, and cakes with a lot of detail will cost much more. Depending on the decorator you choose and the flavors you want, you could end up shelling out a substantial amount of money for a custom cake. 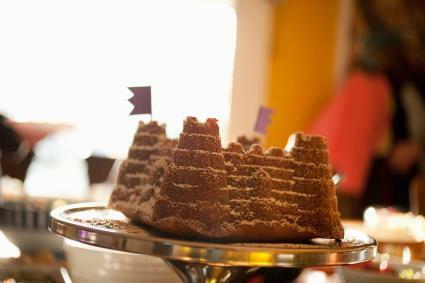 A castle cake that utilizes ice cream cones for the turrets with a simple square cake is easy. Consider using crushed graham crackers for the sand mixed with just a dab of buttercream. Swap out the pinwheels for your bride and groom toppers. Of course, the design isn't the only thing you'll need to consider when crafting your cake. A sandcastle cake is definitely going to involve sand, but thankfully, the kind that cake decorators create tastes a lot better than what you'll find on the beach. Most decorators use brown sugar, turbinado sugar, or another type of natural sugar to make fine sand; for a thicker texture, they might use crumbled vanilla wafers, graham crackers, or homemade cookies. A creative cake deserves a fun display, and there are many great ways to showcase the sandcastle theme. 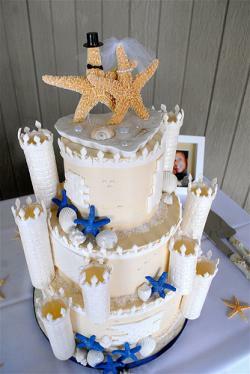 You can try surrounding the cake with real seashells or with pictures of ocean creatures. You could also decorate the entire wedding cake display table with a beach theme, winding sea-colored streamers around the tablecloth to simulate algae and scattering extra brown sugar around the table to serve as a sandy surface. Another fun and interactive idea is to break guests into teams and invite each team to create a sandcastle on the beach after the reception. If you're having a destination wedding or traveling or live far away from the beach where you'll be getting married, you also need to think about cake transportation. A local decorator may agree to travel to your wedding destination and assemble the cake there as long as it's not too far away, but you might also think about hiring a decorator who works closer to the wedding site so that it won't be a hassle to set up the cake well in advance. The sandcastle cake design and coordinating flavors create a delicious dessert for destination beach nuptials. Make sure the display ties into the theme and you are sure to have a cake suitable for a sea-side affair.